Written by Matt Dacy, director of Mayo Clinic Heritage Hall. They stayed in contact, even as their lives took separate paths. He became a distinguished surgeon at Mayo Clinic. She moved to Hollywood and supported her husband in his transition from acting to politics. When the Reagans needed medical attention, it was natural for them to reach out to their friend at Mayo Clinic. 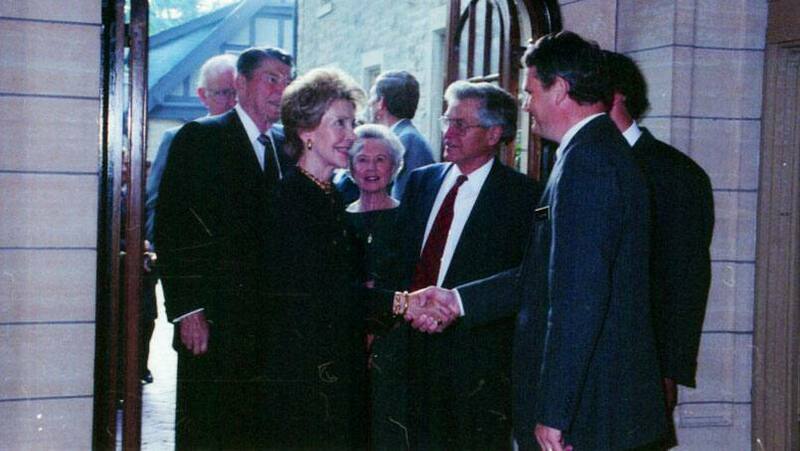 Dr. Beahrs, in turn, introduced President and Mrs. Reagan to a wide circle of colleagues. Mayo Clinic staff members participated in diverse episodes of care during the Reagans' White House years (1981-1989) and after they retired to California. Ronald Petersen, M.D., Ph.D., became close to the couple during the former president's treatment for Alzheimer's disease. In 1994, Mr. Reagan courageously disclosed his diagnosis to the public to build awareness of the condition. After her husband's death in 2004, Mrs. Reagan remained in contact with Dr. Petersen and colleagues. "Mrs. Reagan was a warm and gracious friend," Dr. Petersen says. "She had the highest regard for Mayo Clinic's culture of teamwork and dedication to excellence." Mrs. Reagan is emblematic of Mayo Clinic's unique relationship with the American presidency, spanning virtually every administration from the Civil War to the present. This relationship is bipartisan and nonpolitical, grounded in Mayo's primary value that the needs of the patient come first. White House family members have been dedicated patients, trusted advisers and generous supporters of Mayo Clinic. Some of that history is documented the Heritage Film, "Mayo Clinic and the White House: Caring for America's First Families," narrated by Tom Brokaw. Mayo staff can watch the film on Mayo's internal Video Exchange. Outside of Mayo, you can see a preview of the film, which is also available on DVD through the Mayo Clinic Store. Pay tribute to our unique relationship by sharing your comments on the In the Loop blog, where you'll find tools to share this story with others.